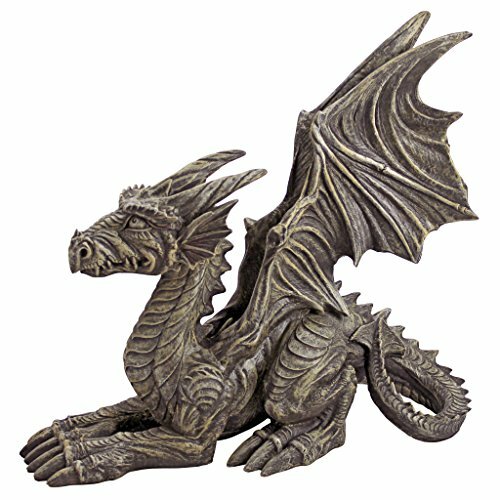 Design Toscano Desmond the Dragon Gothic Decor Statue, 16 Inch, Polyresin, Greystone | Fountain City Art Ctr. With wings ready to take to the air, Desmond is alert to guard home or garden! Our Toscano-exclusive winged dragon is truly rich with sculptural detail from his horned head to his curved, barbed tail. Whether he prowls the living room or menaces in your garden, he displays amazing sculptural detail cast in quality designer resin. 16and 1/2"Wx7"Dx15"H. 7 lbs. DESMOND THE DRAGON has the enviable wings that other dragons only dream of - and they're ready to take to the air to guard your home or garden. ARTIST LIAM MANCHESTER used his skill to create an amazingly detailed sculpture complete with horned head and curved, barbed tail. CAST IN QUALITY DESIGNER RESIN, this collectible dragon sculpture boasts a weathered dark grey stone finish to play up each detail. Our fantasy statues measure 16.5"Wx7"Dx15"H and weigh 7 lbs.